Human bladder epithelial cells (HBlEpC) are a powerful tool in studying bladder epithelial development and function, mechanisms of cancerogenesis, especially those related to urothelial carcinoma of the bladder, as well as the processes by which epithelial cells achieve and maintain their specialized plasma membrane domains, and how these functions are disrupted in disease. HBlEpC from Cell Applications, Inc. have been used as a normal control in a study measuring expression of CD44v6, a potential novel biomarker for bladder cancer. Characterization: the cells have a characteristic morphology consistent with an epithelial origin and are positive for epithelial cell marker cytokeratin 18. (Click to Enlarge) Human Bladder Epithelial Cells: HBlEpC (L). 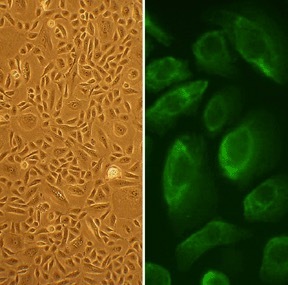 HBlEpC immunofluorescently stained with anti-CK18 antibody (R).